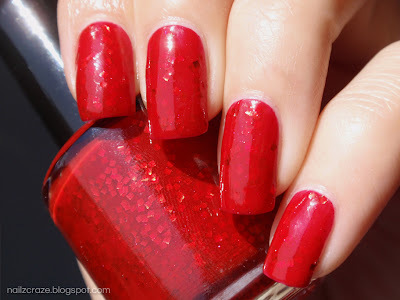 Today I have a very special post for you, I'm going to share with you a new and promising Indie polish brand - GlitterBunny Polish. 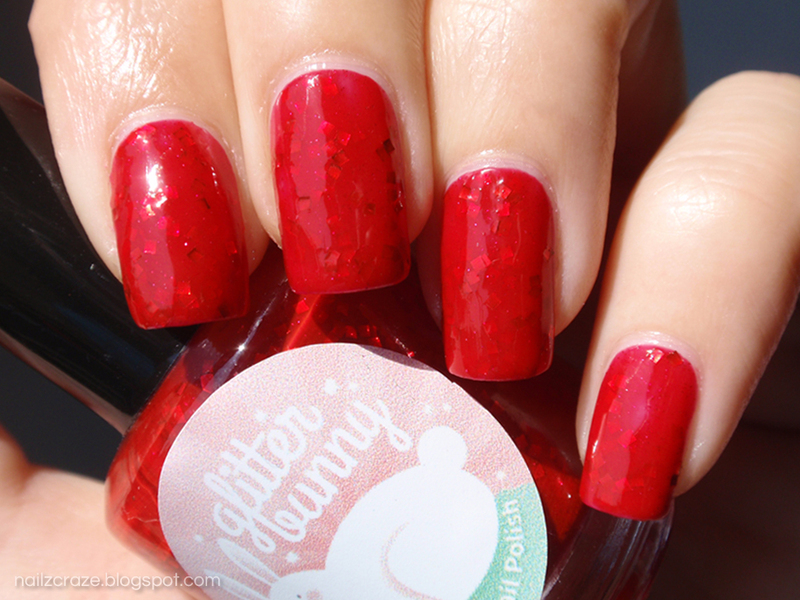 GlitterBunny shop opened a few months ago, and already has a great selection of polishes to offer to you. Nicole, who is behind this brand, set a goal to herself to make cruelty-free and vegan nail polish, and I think she makes great job while maintaining these important values. I chose to review two polishes from the Little Mermaid Collection, and another one I was really curious about and just had to try it for myself. 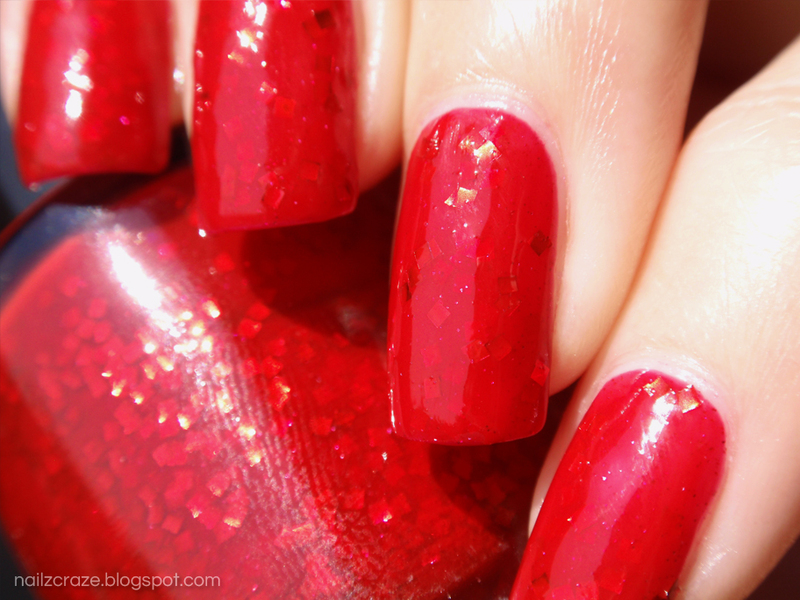 It's a... Dinglehopper is a gorgeous red jelly that contains a mix of two types of red glitter - large squares and tiny glitter specks, which together create a great and beautiful depth. It was really hard to catch on camera how beautiful this polish is, but I guess you will just have to take my word on it. The formula of this polish was quite thick, but a second coat provided a pretty good coverage and a top coat smoothed it out, so I was pretty pleased with the final look. I think you might want to add a thinner to this polish if it gets too thick for you, but overall this is a beautiful shade that I think is worth the "trouble". For the photos below I applied two coats of It's a... Dinglehopper and once coat of Poshe top coat. 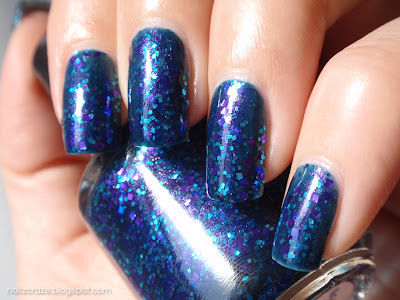 Part Of That World is another polish from the Little Mermaid collection, it's a gorgeous mix of glitter in a dark blue jelly base. This glitter bomb contains large purple square glitter, small teal hex and squares, and a gorgeous purple shimmer. 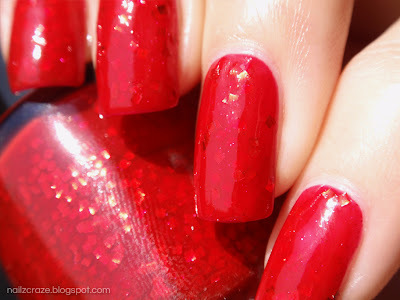 This one is my favorite from the polishes I got to review! I'm not even a fan of blues, but could YOU resist this beauty in a bottle? I know I couldn't! Application was a bit streaky with this one too because of the thick formula, but nothing a second coat couldn't fix. It might look to you a bit sheer on some parts of my nails, but I actually liked this "aqua" look. I thought about layering it over a dark blue color but I decided to show you the real deal without another base coat. I think the color and coverage are pretty good, so I was satisfied with this look. I applied two coats of this polish and one coat of Poshe. Have I already told you I really REALLY love this one? Oh yeah, you know it! It's just gorgeous, the glitter combination and the colors are so great together, and the beautiful shimmer is such a great addition to this polish. Little Pink Dress is a shimmery fuchsia with golden glass flakes. I was very curious about this one, it's hard to see the effect on photos, but I had a feeling this is something I needed to try specially since I love flakie nail polish so much. The flakes in this one were quite large, but this didn't effect the application which was pretty nice and easy compared to the other two polishes. It seemed a bit sheer with first coat, but I achieved a great coverage with a second coat. For the photos I also applied one coat of Poshe on this one to smooth it out. The flakes are hard to see at sun, but they are so pretty and much more noticeable in the shade. Here are some macro and bottle shots of the polishes I got to review, so you can take a closer look at them, and possibly fall in love too! Oh, and I had to add the cute banner from her facebook page, I just love the adorable bunny and the branding of her polishes. GlitterBunny is placed in Israel and ships her lovely polishes worldwide for a low priced fee, just visit the GlitterBunny shop and pick your favorite polishes. I also have a special discount code for you that will give you 10% off your purchase while shopping at her store. Use the code: NAILZCRAZE to redeem the discount. The code is valid only until May 1st, so hurry to place your order. You can also check swatches and macro shots of the polishes at her Facebook page. 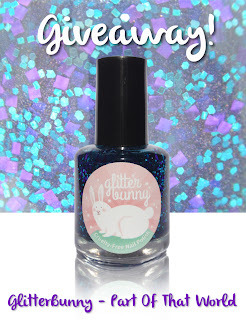 And now for the fun part of this post, you have a chance to win my favorite polish by GlitterBunny. You can enter the giveaway at the Rafflecopter widget below. 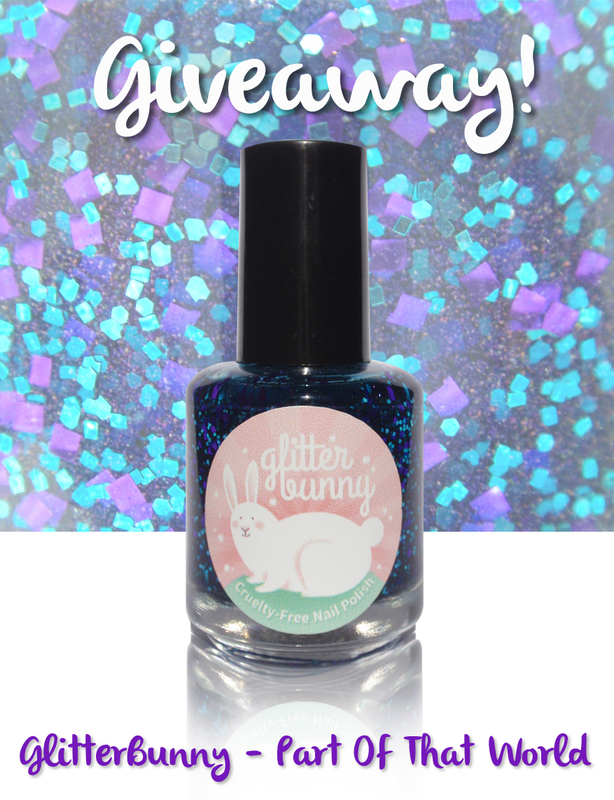 The winner will receive a brand new bottle of GlitterBunny - Part Of That World! The giveaway is open internationally and ends on May 1st. It's a... Dinglehopper is absolutely gorgeous! I just love the depth of it! Colores de Carol - Review, Swatches and GIVEAWAY!